"Your wonderful contribution is making such a difference in people's lives. Our guests, staff, and Board of Directors are extremely grateful you have chosen to support this ministry as we work to break the cycle of poverty one person at a time." 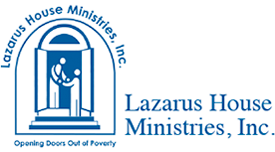 ​- H. Bridget Shaheen, Executive Director, Lazarus House Ministries, Inc.
All of us at Marry & Tux would like to thank all of our loyal customers. Your purchases of wedding dresses, bridesmaids dresses, and tuxedos, has allowed us to support many local charities in helping feed and care for those in need. Internationally we are one of the benefactors for the Father Bash Foundation, in Uganda, Africa. The Father Bash Foundation started several years ago with three orphans and now cares for over 12,000 orphaned children. Without this foundation children would starve, and many still only receive one meal a day. The children in his care have been displaced due to abandonment, war, and extremely poor conditions. The charities we have chosen to support all center around feeding those in need. From the bottom of our hearts, we cannot thank all of our loyal customers enough. Without you, we would not be able to care for the needy. President, Marry & Tux Shoppe Inc.